Out of all the Telecom service provider, one is Tata Docomo. It provides the best recharges,tariff plans and data packs. Tata docomo is more than its tariff plans. It provides the best in quality services to its customers. No matter , what is the issue you are facing, they will b ready to help you. To seek their help you will need to contact them. So, here we are with all the updated contact details of Tata docomo. That is the customer care numbers of Tata docomo, where you can call them at anytime to get your issue resolved. 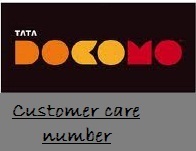 Tata Docomo Customer Care number | Tata Docomo Toll free number. The Tata Docomo is an Indian telecom service provider by Tata Teleservices limited on GSM, CDMA, Walky, Photon Broadband, 3G and other Internet services. Tata Teleservices are provided in 19 telecom circles out of 22 circles in India. Moreover it is the only one that offers fair billing guarantee. Which means it refund back the money, if charged unintentionally for VAS(Value added Service) activation. You may be trying customer care number, so as to register your complaint or setting apn of tata docomo or to apply for DND – Do not Disturb, here is the full list of customer care number. To talk to Toll Free customer care representative, simply dial 121 or 1860-266-5555, and follow the instruction to talk to Tata docomo Customer care. If you are still not satisfied with the call and if your complain is not registered or your query is unsolved, after talking to Toll free customer care representative, then you can appeal to their executive directly by calling Docomo customer care number listed below, according to Telecom Circles of India. These are the customer care number of Tata Docomo, for all the circles. Share your experience of TATA docomo Customer care services by commenting below. Though we try our best to deliver correct information to you. Then to, still if you find any number wrong do inform us by contacting us, or commenting below, on Tata Docomo Customer Care number | Tata Docomo Toll free number post. My Tata Docomo sim card has been lost. Mobile number is .Kindly block the sim card immediately, because some other person is using the card. Hey F J Das, please contact to customer care. And do FIR for this. This website is not responsible for blocking the number. This post is just for your infomation. I want to keep the same number as I had in Kerela, right now am in Telengana. Is it possible?